All, In my attempt to arrive at a 4’x3′ 100W Laser. I decided to give the small 40W a chance to teach me the ropes. Ultimate plan. 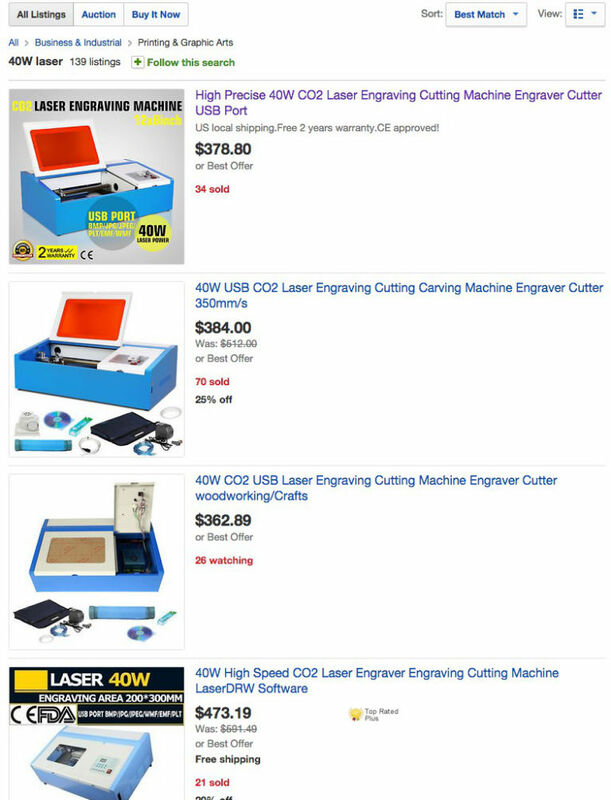 End up with a Full blown 4’x3′ 100W Co2 Laser. with all the bellZ and whistles. Trajectory: Start small… use the good parts left over on the bigger better one. With my new El-Cheapo laser already in hand. I have resisted the urge to at least fire it up one time. My preliminary recon ahas told me that the onboard controller is so heinous. That Ill end up seeking psychiatric help if I go down that path. the on board controller is the Moshi brand and uses their proprietary drawing software. 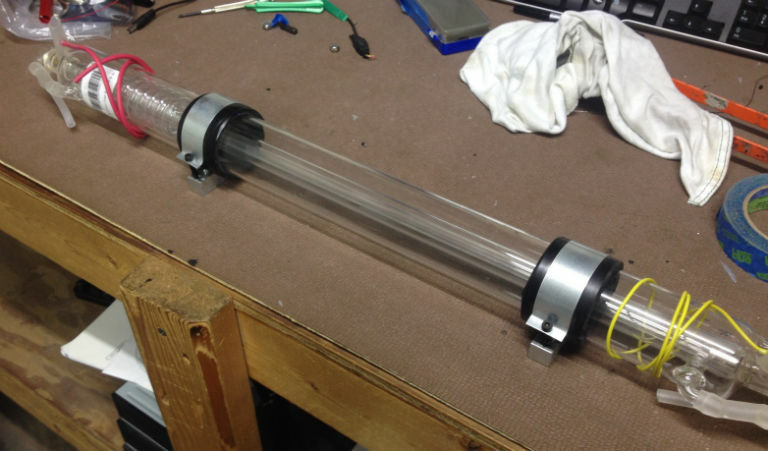 Also the CO2 Tube measures 51.5mm Diameter x 70.5mm Long. which should be a 35W laser. The main Lens measures 12mm. The Gantry system advertises that it has 12×8 inches or 300x200mm. Currently the Laser is in pieces. as my first order of biZ is to inspect all the parts. 1:18mm Air Assist head. (I was going to lathe one out myself but for 16.50? Hmm Buy one…) I can always revisit. The one that shipped with the unit is crapy and houses a small 12mm lens. I suppose I could have lathed out the 12mm to accept a 18mm lens but again for 16.50? me no thinks so! 1: High Quality 18mm ZnSe lens F50.8 to replace the crappy one that shipped with the unit. The Kit I ordered came with a few other bells and whistles. Ill evaluate them as I go. What I have now Im sure I can tweak to get a few more mm of overall travel out of. even though I intend on scrapping this unit in the end. what the heck do I have to lose? I also have on order some Plastic wire cable carrier. This will allow me to manage the cables for both axis’s. I ordered off Amazon. LENS HOLDER: Standard China Aluminum 3 part component. MIRRORS: Installed (Factory Mirrors): 20mm x 2mm as shipped they were quite dirty. even after cleaning I can detect many small imperfections. MIRROR HOLDERS: Spring loaded. 3-Brass knurled adjusters. My plan to harvest some dozen or so Mirrors from hard drives I prob own 50-100 drives So the platters wont be a problem. I found this excellent link (Thanks to imajeenyus)to do a killer job of cutting them from the platters. I intend on this very technique. POWER SUPPLY: Part Num : KH-40W (MfD:F20150623) No confirmed specs.